As you might know if you've been following me on social media, especially Instagram (@ofbeautyand) you might have seen that over the past two or so years, we've gone through quite a lot of renovations and redecorating with all three bathrooms and the kitchen too. We recently updated our upstairs bathrooms in the past six months which now look amazing (you'll have seen them in any of my bath bomb photos) but it's made the downstairs bathroom look very unfinished. Thankfully the lovely people at Tesa have very kindly sent me three of their bathroom accessories to help! Let's start with my favourite item that I was sent, the Tesa towel rail which is very unique in that it features two arms that can move! I haven't come across a towel rail like this, especially at the low price point too. One of the main things that stood out to me when the other bathrooms were being renovated is just how much not only the bathroom furniture and plumping can be, which you would expect but even simple bathroom accessories can be extremely expensive! The entire Tesa 'Smooz' range of bathroom accessories is one of the most affordable ranges I've come across. The range varies from glass shelves, towel hooks, towel rails, soap dispensers and many more so there's any accessory you could want. Another advantage of this range is that it doesn't require a drill or any specialist tools to attach the accessories as everything you need is included within the box. I like that the box is very clear as to what surfaces it can work on so there's no need to worry. I also love that the accessories can be removed without damaging the surface beneath. The style of the bathroom accessories is very simple, minimalist and modern so it will fit with the style of most bathrooms. 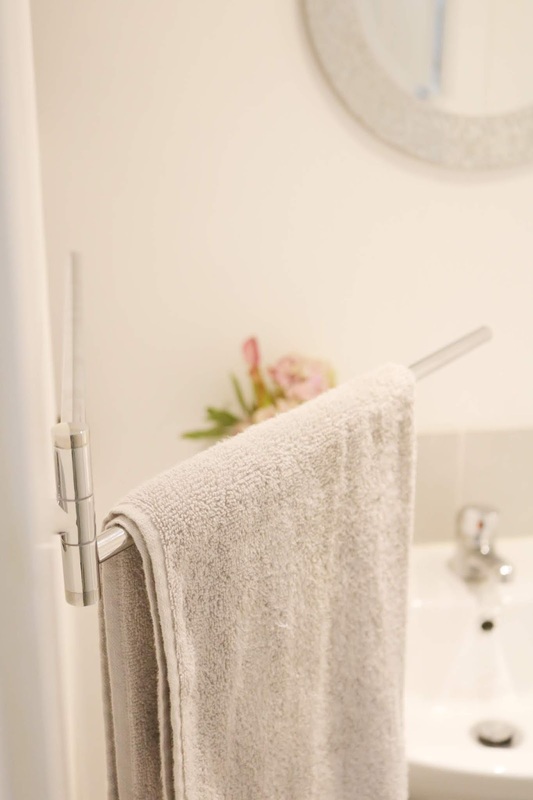 As I've said, the dual towel rail is my favourite of the three items I was sent as it's so unique, versatile and very practical with a modern, simple design that fits perfectly with our bathroom (but it would fit with any of them). The size of the towel rail is perfect, it feels very sturdy despite the price and the process of fitting it was very easy. 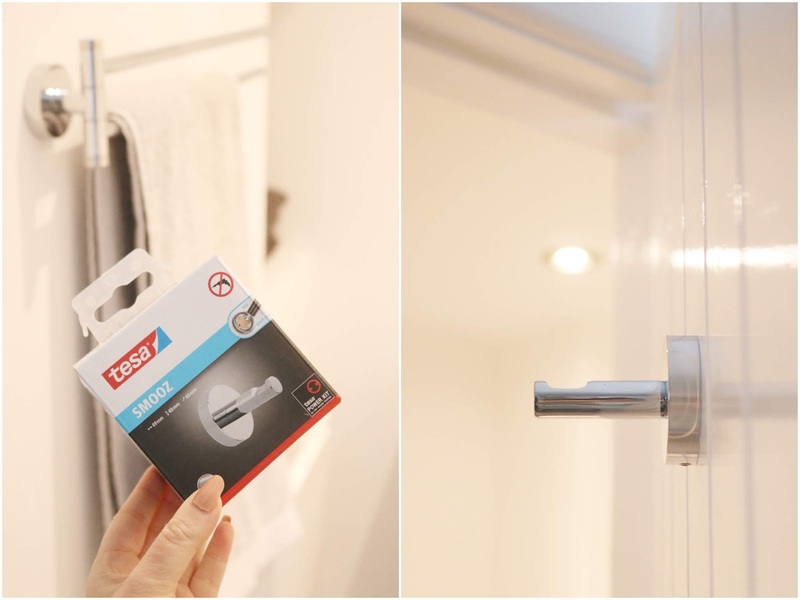 Next up is the Tesa towel hook in the large size which is something we needed in the downstairs bathroom as we didn't previously have one so this package came at a great time! 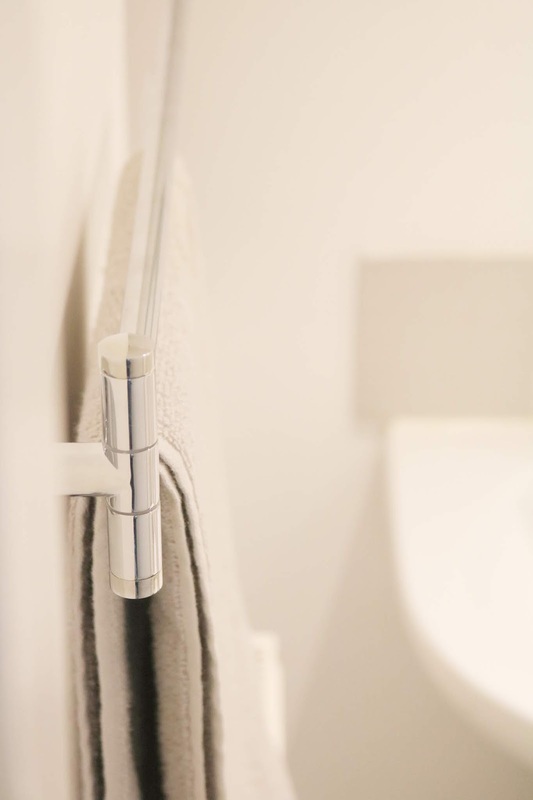 The towel hook has the same chrome finish and the same simple but timeless style as the towel rail so all of the accessories from this range work perfect together. The process of fitting the towel hook was very easy and as it was being fitted to a wooden door, it seems to have even more staying power. The instructions included for each item were very easy to follow and the process features an alan key and glue so you don't need any other tools to fit it which makes it very convenient. I think it would be an ideal range for new home owners, those who aren't used to DIY or potentially in rented accommodation. Last but not least is the toilet roll holder which looks so much nicer than the one we had on the wall previously (it was very dated in it's design and this one is so much cleaner and sleek looking). As with everything else from this range, I like the simple design and it fits in the bathroom perfectly. Fitting all three of the accessories was a very quick process even with the 12 hour wait for the glue to dry. Additionally, if these items couldn't be more convenient, they are available on Amazon along with all of the other items from the range. Overall, I'm very happy with all three bathroom accessories, all of which were needed but we hadn't got round to buying any so the timing was ideal for us. The fitting process was very quick, easy and mess free. I love the sleek and simple designs of this range, they fit perfectly within our bathroom and the price is fantastic for the quality. Have you tried anything from Tesa? What do you think of these bathroom accessories? Oooh these are such handy accessories! These are lovely bathroom accessories and very handy too. We have one of the Tesa towel rails at work in one of the toilets as it fit perfectly in the space we had! We could definitely use some of those in our bathroom! Oh they look lovely! I need to make some changes in my bathroom soon! this is gonna come in handy because our new bathroom is tiny! 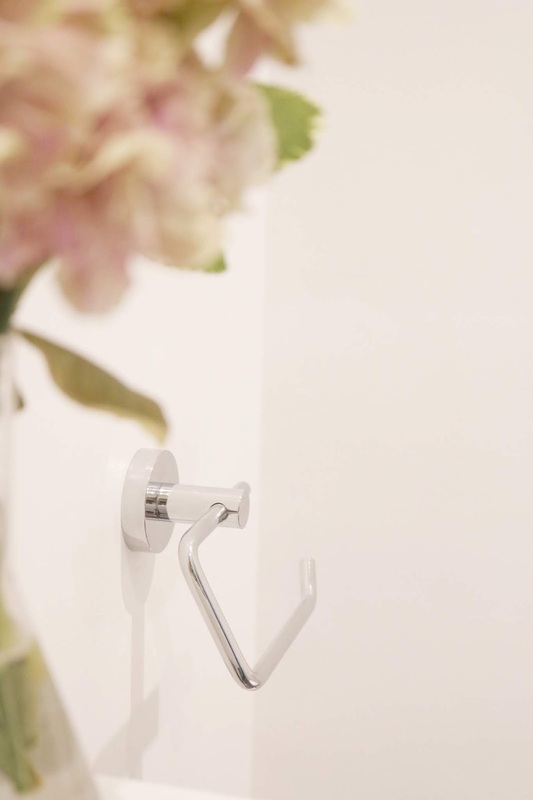 I love cute little bathroom accessories, it really helps to transform a room! The towel rail is a brilliant idea. Such handy bathroom gadgets! I’ve realized over the years that decorating the bathroom can really make a difference. I love all these bits.